The United States presidential election of 1860 was held on Tuesday, November 6, 1860. The election of President Abraham Lincoln served as a trigger for the outbreak of the American Civil War. The United States had been divided during the 1850s on questions surrounding the expansion of slavery and the rights of slave owners. In 1860, these issues broke the Democratic Party into three factions. Each group felt they could best defeat the Republican Party candidate. In April 1860 Democrats met in Charleston, South Carolina to select a candidate for the upcoming presidential election. The convention was in complete chaos. Northern democrats wanted to nominate Stephen A. Douglas. Southern democrats would not support him because he supported new states having the right to choose whether they would allow slavery or not. The convention could not agree on a candidate. Later, in a separate convention, the northern democrats met again and chose Douglas. The southern democrats chose John C. Breckinridge. He was the Vice President of the United States under President James Buchanan. Later, a third group, The newly-formed Constitutional Union party, chose John Bell as their candidate. The party included a few southern democrats who were against slavery. It also included members of the Whig Party and the Know Nothing party. The Constitutional Union Party was against secession and neutral on the issue of slavery. Bell himself was an ex-democrat. The Republican party saw an opportunity when the democrats were split. They met in Chicago on May 16–18. William H. Seward was the favorite among many. Abraham Lincoln had become known as a result of his debates with Stephen A. Douglas. He had the advantage the convention was held in Chicago, the center of his support. After two ballots, there was no clear choice. On the third ballot the republicans chose Lincoln. Lincoln's position on the issue of slavery was known from his senatorial debates with Stephen Douglas in 1858. In one debate he said, "I believe this government cannot endure permanently half slave and half free." One of his most memorable quotes he stated, "A house divided against itself cannot stand." Even so, he was considered a moderate on the issue of slavery. He knew he could not end slavery in the south in one step. Instead he only spoke out against slavery in new American territories. 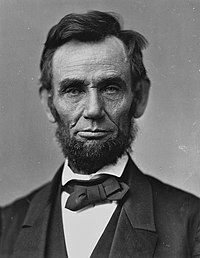 Lincoln won the election with 1,866,452 votes. Douglas received 1,376,957 votes. John Breckinridge and John Bell shared the remaining 1,438,660 votes cast. Lincoln won the majority of the electoral college giving him the presidency. But he won without carrying a single Southern state. Before Lincoln's inauguration as president, seven Southern states declared their secession. In his inaugural address, Lincoln spoke to the Southern states. He said, "In your hands, my dissatisfied fellow countrymen, and not in mine, is the momentous issue of civil war". He went on to say, "The government will not assail you. You can have no conflict without being yourselves the aggressors. You have no oath registered in heaven to destroy the government, while I shall have the most solemn one to 'preserve, protect, and defend' it." Lincoln called them friends and told them we are not enemies. Unfortunately by this time Jefferson Davis was already the president of the Confederacy. They were later joined by Virginia, North Carolina, Arkansas, and Tennessee. Two states, Kentucky and Missouri, attempted to remain neutral. On April 12, 1861, the first shots of the Civil War were fired at Fort Sumter, South Carolina. ↑ 1.0 1.1 "The Election of 1860 and Secession". Terra Foundation for American Art. Retrieved 27 April 2015. ↑ 2.0 2.1 2.2 2.3 2.4 2.5 2.6 "32d. The Election of 1860". The Independence Hall Association in Philadelphia. Retrieved 27 April 2015. ↑ 3.0 3.1 "1860 Republican Convention". The Blue and Gray Trail. Retrieved 27 April 2015. ↑ 4.0 4.1 Kenan Heise. "The 1860 Republican Convention". Chicago Tribune. Retrieved 27 April 2015. ↑ "First Shots of the Civil War Fired at Fort Sumter". VOA Learning English. 11 September 2014. Retrieved 27 April 2015. This page was last changed on 20 April 2019, at 03:02.